The days are gone when you have to reinstall your Windows 10 system after running into trouble. What you need is a Windows 10 system repair disk, which can easily and quickly fix all issues without losing important data on your computer. Still don’t know what is it? Feel free to check this post and you will get more info. Considering the wide use of a Windows 10 system repair disk, it is necessary to create one by yourself. Here will tell you the easiest way of creating a system repair disc for Windows 10. To get started, please prepare a workable Windows computer and a blank CD/DVD or USB drive. 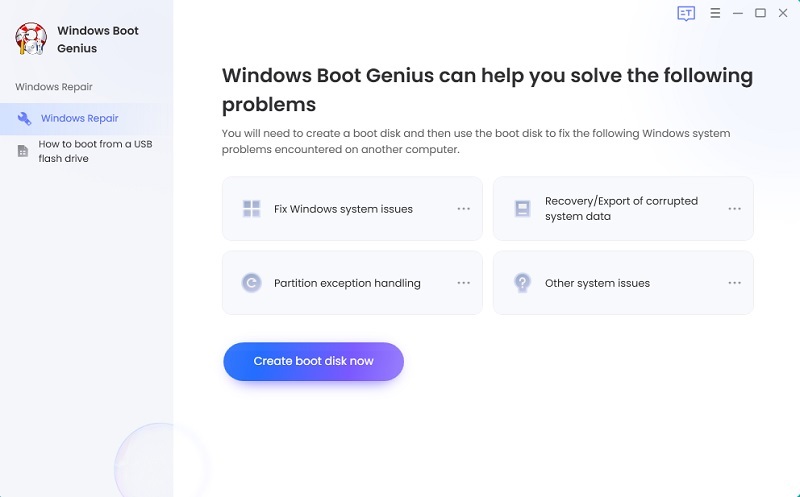 Then download and install the powerful system repair disk creator - Windows Boot Genius. Step 1: Launch the program and insert the prepared CD/DVD/USB into the computer. Step 2: The program will locate the ISO file and check your CD/DVD-Writer or USB automatically. If the burning software can’t find them, please specify them manually. step 3: Click "Burn" to start creating the recovery disk. When the disk is successfully created, you can use it next time when your computer crashes or fails to boot properly. Step 1: Insert the Windows 10 repair disk into the computer that shows an error. And press BIOS settings by pressing keys like DELETE, F1, F2, F10, F12 etc. and set the computer to boot from the newly created repair disk. Step 2: After entering the Windows system, launch Windows Boot Genius again. Choose "Windows Rescue" on the top tab. It shows "Crash before Loading Bar" by default. Choose the right error type, and try the provided solutions to fix the problem your computer has run into. These are all for Windows 10 system repair disk. If you need to create one, you can feel free to try the method introduced above.